You've heard of sand art. This isn't that. Sand art would be gritty and wouldn't taste very good. This is edible art. Salad art. Even my husband, who normally doesn't shy away from diving fork-first into my nicely-presented dinners said that this salad was almost too pretty to destroy. "It's okay - I have pict-"
It lasted about that long. I eat salads a lot - particularly in summer when fresh vegetables look lively. Most of the time, they're pretty simple. But this salad was created for the OXO Slice It Up Recipe Contest, so I got a lot more creative. Most of the cuts were made with a V-slicer mandoline, which is a pretty cool tool for making even slices. And thin slices, too. And waffle cuts. And julienne slices. Nice to have one tool that does all of that. When it comes to arrangement, that's really up to you. Make neat circles or spirals or geometric patterns. Or go with randomness. It doesn't matter, as long as it looks good to you. And if you've got pretty colors and fresh vegetables, It's going to look good. Prepare all the vegetables before you begin arranging. Cut an angled slice off one end of the yellow squash, then continue slicing on that angle so you end up with oval slices. Use the julienne blade to cut thin strips from all around the zucchini so you end up with dark green julienned strips. You can cut the rest of the zucchini into slices, if you prefer. I used it for other purposes. Peel the cucumber. Slice the cucumber into waffle slices. If you slice it thinly and turn the zucchini 45 degrees with each cut, you'll end up with lacy slices rather than wavy ones. Divide the onion slice into rings. Arrange the vegetables on a platter in any design you want, reserving the cauliflower crumbles and the zucchini strips for use as garnish. Sprinkle the salt over the top (I used a red salt) then drizzle with oil and vinegar. This salad doesn't need a lot of dressing - just a light drizzle here and there. Pull the petals off the chive flowers and strew them over the top. Serve. I make a LOT of salad dressing; I don't buy any at all. So when I saw that OXO was looking for some bloggers for their Healthy Eating with OXO campaign, and I looked at the list of items available for review, I was immediately interested in the salad dressing shaker. It wasn't the most expensive item on the list, but it looked like something I could use. And, well, it was something I didn't already own. I love my OXO scale and use it almost every day, but I don't need another one. I have a mandoline and peelers and a salad spinner. So I asked for the salad dressing shaker. I've used it a few times already and while it's not an earthshaking innovation, it's got a lot of useful features. It's got easy to read measurements, if you're being precise, and it's dishwasher safe and easy to hold onto. For pouring, it's got a pouring spout with a little toggle-thing on top. I was a little worried that the top piece wouldn't seal well, but it worked perfectly. And maybe it's just me, but I think this would also make an excellent drink shaker. I haven't tried that yet, but I don't see any reason why it wouldn't work. But for now, let's just make some salad dressing, eh? This dressing includes an interesting cherry and grape syrup that I got from Marx Foods when I cashed in a gift certificate I had. I figured that raspberry worked well in salad dressing, so why not cherry? Put all the ingredients into the salad dressing shaker. The salad I made included the salad greens you expect, along with some chunky pieces of cucumber and some cooked, chilled asparagus. I received the salad dressing shaker from OXO for my own use free of charge, as well as a second salad dressing shaker to give away. I was not required to say nice things. Once again, I'm throwing my hat in the ring for another contest at Marx Foods. This time the secret ingredient is morel mushrooms - and that comes into play two different ways. 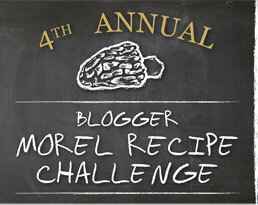 Each of us received (at no cost to us) a sample of dried morel mushrooms to work with, and the winner of the contest will receive fresh morels. Instead of going wild with multiple dishes and a vast number of ingredients, I decided to go the opposite direction. Simple. Well, sort of simple. Not a lot of ingredients. I used chive flowers to garnish this dish, which adds a nice pop of light purple. The flowers taste ... well, chive-y and a little bit floral. I have no idea if you can buy chive flowers anywhere, but chives are incredibly easy to grow and they re-seed and come back every year. Or you can grow them in a pot on a sunny window sill. Snip off what you need, and they'll supply you for a long time. As far as the morels I used, I felt a little bad about grinding them up because they're such weird-looking things - like strange little elf-hats - but I used sliced and fried morels in last year's contest (which I didn't win) so I figured I'd do something different this time. I considered stuffing them, but then went completely in the other direction. Voting for this contest runs from May 1-3 on the Marx Foods site and is live right here! I appreciate your votes! Put the dried morels in a food processor or spice grinder (I have a coffee grinder reserved specifically for spices) and process until it's mostly a powder. It's fine if there are tiny bits, but you don't want any larger pieces. Put the morel powder in a bowl, add the boiling water, stir to moisten, and set aside until it has cooled to room temperature. Pile the flour on your counter top, make a well in the center, and add the morels, egg, and salt. Break the egg yolk with a fork, then begin stirring in, dragging in more and more flour until you have a stiff paste. Now you can get in there with your hands and begin kneading. Add a bit more water, a teaspoon at a time, if you need the moisture to incorporate all the flour into the dough. Continue kneading until you have a smooth dough - okay, there will be mushroom bits, but the dough itself should be smooth. If you're going to use a pasta extruder - as I did to make rotini pasta - you're going to want a very stiff dough. If you're going to be working it by hand, the dough can be a little softer. In either case, wrap the dough in plastic wrap and set aside to rest for an hour before continuing to work it. You can make this a day ahead and refrigerate it until you need it. When you're ready to make the pasta, roll it and cut it into the size/shape you prefer, or run it though your pasta extruder according to the manufacturer's directions. Toss the pasta with a bit of flour, if needed, to keep it from sticking. While you're cooking the pasta in boiling salted water, you can make the browned butter. Heat the butter in a large saute pan on medium heat. Add the salt. Shortly after it froths up, it will begin to turn brown, and you'll see browned bits begin to form in the clear butter. This is what you're looking for. It will also begin to smell nutty. Watch it carefully - you want it browned, but not burned and black. Add the chives, then add the cooked pasta (because the pasta is fresh, it cooks incredibly fast). Toss the pasta around in the pan to coat with the butter, then serve immediately. Top with some additional fresh chives and, if you have them, some bits of chive flowers. There are probably as many potato salad recipes as there are people on the planet. I mean, I've got my basic mayonnaise recipe, and I've got a German potato salad recipe, and I've got multiple variations of both of those. And there's the "oh, gosh, I'm missing some ingredients, but I can cobble something together" recipe. When I made the first mayonnaise potato salad for my husband (then boyfriend) many years ago, he loved it. After that, it was hit and miss. He always liked it, but sometimes he really really really loved it. If we were at a potluck or barbecue he'd critique the potato salad. But he had no idea why he liked one more than another. It was up to me to figure it out. Many many bowls of potato salad were made and consumed, but I still couldn't figure out what it was that he liked so much. Was it the potatoes? No. Mustard? No. Relish? No. Onions? No. I put things into the potato salad and I took them out. And then finally I figured it out. It wasn't an ingredient that was included or not - it was how much of an ingredient was in the potato salad. Need a hint? This Friday has a theme. No, not chicken in the potato salad. It's eggs. I always put eggs in potato salad. But it doesn't get the husband-seal-of-aproval unless there are a LOT of eggs. I could probably make egg salad and add a potato to it, and he'd be a happy guy. On the other hand, I like potatoes in my potato salad, and I'm the one with the pointy knives and the mixing bowls, so I set some limits on egg content. This potato salad has the required egg bounty, but it also includes a few interesting ingredients. Because of the red pepper and the paprika, it's a peachy color instead of the more common yellowish-creamy-white. Peel the potatoes as soon as they've cooled down enough to handle. Cut them into chunks (whatever size you like) and put them into a large mixing bowl. Sprinkle the cider vinegar over the potatoes immediately and toss them around. The potatoes will absorb the vinegar completely. Let the potatoes cool while you prepare everything else. Add all the remaining ingredients to the bowl, and stir to combine. Taste for seasoning and add more salt, if needed. If you prefer a creamier potato salad, add more mayonnaise. You can also add some of the juice from the bread and butter pickles, if you like. Refrigerate until serving time. Personally, i think potato salad is best the next day, but you can serve it right away. For more information about Whole Foods Friday, take a look at the tab at the top. Another Friday and another adventure with Whole Foods. You might have noticed that I like to do themes for these Friday posts - an ingredient, a cooking method, a particular course. This time the theme is birds. First, chicken on the grill. Then ... well, you'll see. Or, okay, if you're in a hurry, scroll down and you'll really see. My absolutely favorite way to cook chicken outdoors is to cook it on the rotisserie that's part of my gas grill. As the bird spins around it sort of bastes itself and the result is a really juicy chicken. The downside of the rotisserie is that if you don't get the bird evenly balanced and if everything isn't secured properly, you can end up with the spit turning and the bird staying in place, which means an extremely unevenly cooked bird. And trying to re-secure a hot chicken on a hot spit isn't a lot of fun. Don't ask me how I know that. I figured I'd spatchcock a chicken, instead. This is a technique anyone can use, whether they're cooking on the grill or in the oven. Spatchcocking sounds technical, but it's simple. The best tool for the job is a heavy-duty pair of poultry shears. You simply cut on either side of the backbone to remove it. If you're staring at a raw chicken and wondering which side has the backbone, just look for the nub of the neck, and on the opposite side is the fatty bit that some people call the pope's nose. Just cut from one end to the other, and you've got a chicken that opens up and will lay fairly flat on the grill. You can remove the keel bone (on the breast side of the bird) or push down on it really hard to crack it so the chicken is even flatter, but in this case it's not necessary. You'd want it really flat if you planned on cooking it in a pan and wanted maximum contact with the hot pan. In this case, we're roasting. The hot air is cooking it, so it doesn't matter if it's completely flat. Or maybe it matters in some technical sense, but in practice, this works just fine. If you don't want to wrestle with a chicken, I'm sure the meat guys at Whole Foods would take care of this for you. Just ask them to spatchcock the bird, or if you can't remember that, ask them to butterfly it for you. After the bird is spatchcocked, season it all over with the salt, pepper, and paprika. Let it rest while you prepare your grill. If you're cooking on a gas grill, you can adjust the heat as you go. On a charcoal grill, you'll want the coals on either side of the grill so that the bird can cook in the center, by indirect heat. I like to cook the chicken over direct heat on the skin side before I flip it over and move it to direct heat. That's not necessary, and might not be convenient on a charcoal grill. Cook the chicken until the internal temperature in the breast is at 155 degrees and the temperature in the thickest part of the thigh is 170 degrees. The chicken will continue cooking as it rests. When it's done, the joints will be loose and the juices will run clear. Let the chicken rest for at least 10 minutes before you start cutting it apart. I like serving the wings, drumsticks, and thighs as whole pieces, and carving the breast into thick slices. This bread is just slightly sweet - not like a sweet roll that you'd have for breakfast, but slightly sweet dinner roll. Great with a dab of butter. A really good match for spicy food or barbecue. Like any shaped bread, you're never going to get two that look alike - but that's part of the charm. They'll rise differently before baking, and they'll rise differently in the oven. It's unpredictably fun. And every once in a while, you'll get one that looks just plain weird. Hey, you have to sample one, right? The hardest part about making these is getting the eyes and beak to behave. The rising dough wants to push them out, so you need to insert them a lot farther in than seems right. And then give them another little push right before they go into the oven. I wanted to use completely edible items for the eyes and beak, so I used slivered almonds for the beaks and chocolate pearls for the eyes. I was a little concerned that the eyes might melt and make a mess, but it actually worked. The pearls are chocolate-coated crunchy cereal, so they had some substance. Something more solid - like a peppercorn - would probably work better as an eye, but most folks don't want to bite into a peppercorn, so if you wanted to use something like that, you'd be wise to warn people. A piece of black olive or a bit of dried fruit should work, too. You probably don't need to run out and buy something - look around your kitchen and see what you have that would be edible and suitable. You want the liquid to be at room temperature or just slightly warmer, so if your orange juice is straight from the refrigerator, use warmer water to compensate. You won't ruin anything by using cool liquid, but the dough will rise much, much slower. Combine the water, orange juice, sugar, yeast, and bread flour in the bowl of your stand mixer. Knead it with the stand mixer fitted with the dough hook until the dough is smooth and elastic. Add the salt and olive oil, and continue kneading until they are completely incorporated and the dough is smooth, silky, shiny and elastic. Sprinkle your work surface with flour and turn the dough out. Knead it briefly, then divide it into 8 even pieces. Take one of the pieces and cut off about 1/4 of the dough. Form that smaller piece into a ball. Form the other piece into a teardrop shape. Make a divot in the fat part of the teardrop-shaped piece, but not too close to the edge as shown in the photo. Place the ball on top of the teardrop shaped piece on top of that divot you just made. Place this on the baking sheet, with the pointy end facing the center of the sheet. This will make it easier to work in the face later. Continue until all the birds are shaped. Cover the birds with plastic wrap and set aside until nearly doubled in size, about 20 minutes. Using a toothpick or skewer, poke holes in the first bird's head where you want the eyes and beak. Insert the eyes and beak, pushing them well into the dough. Keep in mind that they don't all need to be facing straight forward - you can position the faces so they're looking up, down, or to the side. Continue with the rest of the birds, until all of them have eyes and beaks. Cover them with plastic wrap and let them continue rising until doubled - another 5-10 minutes, depending on how long it took to get the faces finished. Uncover the birds again, and if the eyes and beaks have started protruding, push them back in again. Bake at 350 degrees until the birds are nicely browned, about 30 minutes. Remove the birds from the baking sheet and put them on a rack to cool. If the eyes and beaks need to be pushed back in again, do so while the buns are still warm. Let them cool completely on the rack if you're not serving them right away. Want more creative bread? Check out Bunny Bread! I decided to share one last bread from King Arthur Flour's Whole Grain Baking. 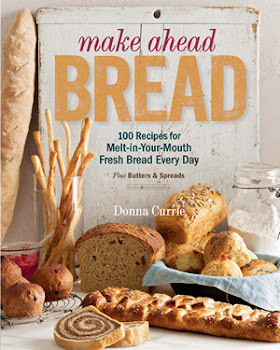 I wrote about this book for my column, Knead the Book, on Serious Eats, and I really liked all of the breads I baked. Sure, you can substitute whole grain flours for white flour, and it will usually work. But why not use recipes that are designed for whole grains? That's what this book is all about. So far, I haven't found any recipes that I didn't like. And quite a few that I know I'll be making again and again. This particular bread is a little bit sweet - in a good way - and is soft and fluffy.It's a good sandwich bread, and would be a great whole wheat bread for people who don't like typical whole grain breads. The only dilemma when making this bread is what on earth you're going to do with that other half of the beer you open to make this. But I'm sure you'll think of something. When it comes to beer, I suggest using a light, mild-flavored beers. The heartier, more flavorful beers are great for drinking, but they can sometimes leave behind bitter flavors when you bake with them. Combine all the ingredients, and mix and knead them – by hand, mixer or bread machine – until you have a soft, smooth dough. Cover and allow the dough to rise until it’s puffy and nearly doubled in bulk, 1 to 2 hours. Lightly grease an 8 1/4 x 4 1/4-inch loaf pan. Gently deflate the dough, and shape it into an 8-inch log. Place it in the prepared pan. Cover it gently with lightly greased plastic wrap or a proof cover, and allow it to rise till it’s crowned about 1 1/2 inches over the rim of the pan, 1 1/2 to 2 1/2 hours. Near the end of the bread’s rising time, preheat the oven to 350˚F. Uncover and bake the bread for 30 to 35 minutes, tenting it with foil after 15 minutes. The bread is done with it’s golden brown and an instant-read thermometer inserted in the center registers 190˚F. Remove it from the oven, and after a minute or so turn it out onto a rack. Brush with melted butter if desired; this will keep the crust soft. Cool the bread for 30 minutes before slicing. Since I work from home, my morning routine doesn't include guzzling coffee and battling traffic. Instead, I stumble downstairs, make a cup of coffee, and sip on it while catching up on emails. Depending on what I have planned for the day, I might be wandering around in my pajamas for quite a while before I clean myself up and get dressed. Sometimes that just means more time online, reading, writing, or editing. Sometimes that means I do a few things in the kitchen. The other day, that meant cutting up some marshmallows that I had made the night before. It wasn't long before I was brushing powdered sugar off my pajamas. Which was perfectly fine with me. If you've never made your own marshmallows, you should give it a try. At least once. After that, if you want to start playing with more exotically flavored marshmallows, don't blame me. They're sort of addicting. Unlike commercial marshmallows, home made marshmallows are still sort of moist inside. Not wet, exactly, but soft and smooth and fluffy. I'm never tempted to eat commercial marshmallows. They're just not that appealing. But fresh homemade ones are a whole different story. The primary flavor in most marshmallows is vanilla, but it's very subtle. I like vanilla a lot, so to amp up the flavor, I used double-strength vanilla. If you've never tried a double-strength vanilla and you like the flavor, I suggest you give it a try. Or, if you want to experiment, you can try other extracts. Lemon marshmallows? Why not? Almond? Sounds good to me. And instead of using plain old powered sugar to dust your finished marshmallows, you could use powdered candy canes for mint flavor, or mix some cocoa with your powdered sugar for a burst of chocolate. But there's a reason why vanilla marshmallows are so popular. They work perfectly in your s'mores. And they're great if you poke them with a stick and roast them over a campfire. While this is a very simple recipe, I don't suggest attempting it without a stand mixer. A hand-held mixer might not survive the mixing. Place the gelatin in the bowl of your stand mixer and add 1/2 cup of the water. Let this stand while you work on the rest of the recipe. In a small bowl, combine the powdered sugar and cornstarch. Spray a 9x13 glass or metal baking pan with baking spray. Sift the powdered sugar into the pan, making sure that the entire pan is covered in a thin layer. Set aside the excess. Put the granulated sugar, corn syrup, salt, and the remaining 1/4 cup of water into a medium saucepan. Cover the saucepan and heat on medium-high heat until it comes to a boil. Let it cook for another minute at a boil. Uncover the pot and attach a candy thermometer to the pot. Continue cooking until the mixture reaches 250 degrees, then turn off the heat. Attach the whisk attachment to the stand mixer and begin mixing the gelatin on low speed. Pour the hot sugar mixture into the bowl slowly, down the side of the bowl so it doesn't splash. Don't worry about getting every last bit of the sugar mixture out of the pot - it's very hot and probably not worth handling for a few tablespoons. To make cleanup easier, fill the pot with water right away. Turn the mixer up to high speed and beat until the mixture is thick, no longer increasing in volume, and has cooled to lukewarm. Add the vanilla in the last minute or two of mixing. Now comes the fun part. Or the messy part. Pour the marshmallow mixture into your prepared pan, trying to pour it somewhat evenly. Spray a spatula with the nonstick spray and use to to even out the top as much as possible. Sift the reserved powdered sugar mixture over the top. If you want to flatten the marshmallows even more, put a sheet of plastic wrap on top and press gently to flatten it. Then remove the plastic wrap and let the marshmallows sit uncovered for at least 4 hours, or overnight. Dust a cutting surface with powdered sugar, then turn out the marshmallow block. Using a pizza cutter or sharp knife, slice the marshmallow block into strips. It's best to cut quickly rather than deliberately. As you cut each strip, dust the cut edges with powdered sugar. After all the strips are cut, cut the strips into squares, dusting the cut edges again. Store the marshmallows in a sealed container. And on chilly nights, these marshmallows are great in a steaming cup of hot chocolate. Lately I've seen (in a glancing sort of way) a few comments about baking bread in a smoker. The idea intrigued me. I've baked bread in my gas grill, so why not bake it in my electric smoker? One big difference is temperature. My smoker maxes out at 275 degrees, which is considerably lower than my usual bread-baking temperature. I've made bread sticks at low baking temps when I wanted them to dry out without getting very brown, and I've compromised on temperature when I've had something else in the oven that needed a lower temperature. But the low temperature bake plus the addition of smoke sounded like a worthy experiment. I decided that rye would work well with smoke, and I added buttermilk for a little bit of tang. But what shape? I figured that a traditional loaf would have the smoke flavor on the crust, but I didn't think it would work its way very far into the bread. On the other hand, buns would have the smoke flavor in every bite. So I went with buns. These would be great for any type of barbecue sandwich, with the added smokiness enhancing the sandwich in a way that a plain bun just couldn't do. Also great for a non-smoked sandwich where smoke would be an asset. Maybe not for the peanut butter and banana sandwich, unless you're likely to add bacon to that combination. Combine everything (except the olive oil and caraway seeds) in the bowl of your stand mixer, stir to combine, cover with plastic wrap, and let it rest for 20 minutes. When the rest time is up, knead the dough with the stand mixer fitted with the dough hook until it is smooth and elastic. Add the olive oil and caraway seeds and continue kneading until they are fully incorporated. Cover the dough and let it rest until it has doubled in size, about an hour. If you want individual rolls, you can use two pans - I went for pull-apart rolls and placed all 12 on my half-sheet pan. Cover the rolls with plastic wrap and set aside until nearly doubled in size - about 25 minutes. Meanwhile, prepare your smoker and soak your wood chips (I used maple, but use what you like) according to the manufacturer's directions. Set the temperature for 275 degrees. When the dough has just about doubled, uncover it and bake it in your smoker (don't forget those wood chips!) until the dough is lightly golden and cooked through, about 45 minutes. Remove the buns from the smoker, and remove them from the pan to cool on a rack. You might not think of chocolate cake as summer food, but on several food groups I belong to, the answer to the question, "what dessert can I bring to a barbecue?" is often "chocolate sheet cake." Sure, fresh fruit is nice and ice cream is refreshing, but a chocolate sheet cake is very portable and won't wilt in the heat. Instead of a massive cake, I scaled this down so it fits in an 8-inch or 9-inch square pan, whichever you have available. Perfect for the family, or a small gathering. A round pan would also work, but that square pan will allow you to cut nice, even squares. Instead of butter, this cake uses coconut oil. A few years ago, coconut oil was considered the most evil of all oils. Lately, some people consider it to be one of the more healthy options. I'm not going to weigh in on that debate - there's plenty of information available for you to make your own decision. But because of its newfound proponents, coconut oil is becoming much more available in stores. If you haven’t used it yet, you might be tempted to do so soon. And if you don’t like cooking with it, you can use it as a moisturizer for your skin. You can't say that about the bottle of barbecue sauce you tried but didn't like. I'm not a big fan of shredded coconut, and the flavor isn't the first thing I'd pick for a dessert, but the oil's flavor isn't overpowering. Mixed with the chocolate in this cake, it adds a nuttiness, but most people wouldn't pick the flavor out as coconut. Preheat the oven to 350 degrees and spray an 8-inch or 9-inch square baking pan with baking spray. Combine the flour, cocoa, baking powder, and salt in a medium bowl. Whisk to combine. If the cocoa is lumpy, pass it through a strainer to break up the lumps. Set aside. In a separate bowl, beat the coconut oil and sugar until it is combined and well-beaten. Add the vanilla, and continue beating until it is incorporated. Add the eggs, one at a time, and beat until they are completely incorporated. Stir the flour mixture into the beaten mixture in three additions, alternating with the sour cream in two additions. Mix well enough to combine, but don't over-mix. The batter will be thicker than a typical cake batter. Transfer the batter to the prepared pan and smooth the top. Bake at 350 degrees until a toothpick inserted in the center comes out clean - about 30 minutes. Let the cake cool for 5 minutes in the pan, then turn it out to cool completely on a rack. Dust with powdered sugar before serving, or frost with your favorite frosting. Tropical Traditions provided me with a free sample of virgin coconut oil to review. Since I was under no obligation to review it, there was no risk in giving it a try. A while back, I won a little gift certificate from Marx Foods and I finally got around to cashing it in. One of the things I spent that gift certificate on was wild fennel seeds. I adore fennel seeds. I put them in Italian sausage when I make my own, and I use the seeds - whole or ground - in pasta sauce. Not all the time. But it's a flavor I really like with tomatoes. When I opened the jar of wild fennel, it had the same familiar smell of regular fennel, but there was a difference - hard to describe, really - but it made me anxious to use it in a dish where it was the only spice, so I could taste it without too many competing flavors. So of course I made pasta. What else? This is a quick recipe where the sauce is done in the time it takes to cook the pasta. If you don't have wild fennel seeds, regular fennel seeds would be fine. If you don't have that, basil or oregano would be great, too - or even a mix of spices. Use what you like; it's your dinner. As far as whether I like the wild fennel better than regular fennel - well, I'm not sure yet. But that's okay. For the spices I like a lot, I often have several different varieties. I've always got several types of cinnamon, and I usually have both Mexican oregano along with at least one other type. I almost always have several vanillas. So I kind if like the idea that I now have two different types of fennel seed to choose from. Is anyone else ever going to notice? I have no idea. I think I'll make two different batches of Italian sausage next and do a side-by-side comparison. Maybe then I'll be able to tell you what the difference is. While you're cooking the pasta, make the sauce. Heat the olive oil in a saute pan on medium heat. Add the onion and cook for a minute or two before adding the garlic and salt. Crush some of the fennel seeds and add all of them to the pan. You can peel the tomatoes or not - your choice - I prefer them peeled. And if you don't have small tomatoes, use 4-5 medium ones or 2 large ones. Or even a can of diced or whole tomatoes would be fine. Core the tomatoes, cut them into chunks, and add them to the pot. Cook, stirring as needed, until the tomatoes break down a bit. Taste for seasoning and add salt, if needed. When the pasta is cooked to just al dente, add it to the pot with the sauce, and cook it with the sauce for another 30 seconds or so. If the pasta seems too dry, add some of the pasta cooking water. When I made a loaf of Bunny Bread for Serious Eats for my post the week before Easter, I expected that a couple people would say Awwwww, how cute, but I didn't expect the popularity that post got. I mean, you always hope that a lot of people will like something you've made, but it's hard to predict. Sometimes I think a recipe is pure genius, and it gets very little attention. And sometimes, things sort of explode. My first indication that Bunny Bread was destined for success was when I got an email from Serious Eats telling me that MSNBC did a blurb about the bunny posting on Serious Eats. And it ended up the #1 post for the week on Serious Eats. Then, I started getting hits from other sites that linked directly back to me. And here's another bunny, all the way from France. 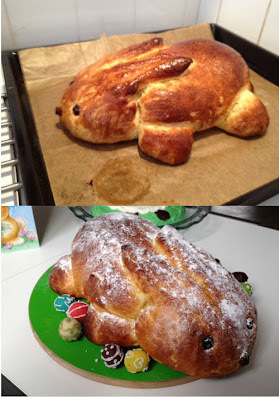 This is what the email said, "My girlfriend Justine made a bunny bread for Easter lunch in Poitiers, France after I showed her your post. It went well with the traditional Poitiers Easter lunch of roast goat, and also worked really well with the dessert I made, brownies cooked in eggshells. I've attached a photo of the bread and the brownies." What, you want to see the brownies, too? Well, okay! If you made bunny bread based on my recipe, send me a photo and I'll add it to this post. Thanks, everybody, for sharing! I love making ice cream. I can create crazy flavors, if I want to, or I can stick to basics. For me, a basic flavor is chocolate. This ice cream isn't just chocolate, though - it's CHOCOLATE. It shouts from the rooftops. Not only is the flavor deep, the ice cream itself is thick and rich. The base is a custard and depending on how much you let it thicken, you could serve it as-is. There's nothing at all wrong with chocolate custard. But churn it into ice cream, and you bring it to another level. The one pitfall you might run into with this recipe is that if the custard sets up too firmly, your ice cream maker might have issues churning it. But that's easy to fix. If the custard doesn't thin out enough when you whisk it, you can add a little extra heavy cream to get it to the right consistency. Combine the sugar, salt and cocoa in a saucepan. Whisk them together to get rid of any lumps in the cocoa. Add the milk and cream, whisk to combine, and turn the heat to medium. Cook, stirring until the sugar dissolves. Continue cooking, stirring as needed until the mixture comes to a simmer. Meanwhile, whisk the yolks to break them up, and chop the chocolate into small pieces. A serrated knife does a great job with chocolate. When the milk mixture reaches a simmer, turn the heat off and ladle some of the hot milk into the yolks, slowly, mixing continuously, until you've added about a cup of milk and the yolks are warmed. Pour the warmed yolks back into the pot slowly, whisking continuously, Turn the heat back on, up to medium, and cook, stirring with a spatula or wooden spoon, until the mixture thickens - you'll feel the mixture thicken as the spoon drags through it. If you run your finger across the back of the spoon, you should see a clear line where you wiped the spoon. Turn the heat off, add the chocolate, and stir until it is completely combined. Add the vanilla and stir it in. Strain the mixture through a fine strainer (to remove any lumpy egg bits) to a storage container and refrigerate until it is fully chilled. When you're ready to churn the mixture, whisk it - this should loosen it up a bit. If it seems too thick to churn in your machine, add some heavy cream and whisk it in. Churn it according to your ice cream maker's instructions. Might as well make some sauce for the ice cream. This is a relatively thin sauce - very pourable - but when you pour it over cold ice cream to serve, it will get thicker. If the sauce was thicker to begin with, it might be too thick on the ice cream. Sugar is a tricky thing to work with. In theory, you don't need to add the water - you can melt sugar in a dry pan. If you're super-confident, you can do that. But sugar burns easily, and there's always the risk that you'll burn some of the sugar before the rest is completely melted, and then you'll have to start over. Burned sugar tastes bitter. Trust me, I know. I've burned plenty of sugar. Put the sugar, salt, and water in a heavy bottomed-pot with a lid. Slap the lid on and turn the heat up to medium, or just a bit lower. Cook until the sugar is melted - you'll know because the liquid will be completely clear. It might be turning a little golden, but it won't be cloudy. Meanwhile, combine the cream with the vanilla and set aside until you need it. Take the lid off and continue cooking. Don't stir it, just leave it be. Cook until the mixture turns a nice amber color. Even though you're not touching it, you do need to watch it - the sugar can go from nicely browned to burned in a heartbeat. Add the butter and whisk it in completely. The mixture will foam up. That's fine. Turn the heat off and add the cream, whisking as you go. The mixture might seize up for a while, but it will smooth out again. If you need to, you can turn the heat on again to get it all completely combined. Let it cool a bit, then transfer it to a container for storage. A pint canning jar works well. Keep refrigerated. What the heck. We've got ice cream and sauce. Might as well make whipped cream so we can have a sundae. I used to use an electric mixer to make whipped cream. I've also got one of those nitrous dispensers. I've used my stand mixer, too. But really it doesn't take all that long to use hand whisk and whip it up. The only danger is that if you whip it too much, you could end up with butter instead of whipped cream. It's a little harder to over-do by hand. I don't like my whipped cream really sweet, but that's something you can adjust when you make your own. In this case, with ice cream and sweet caramel, I didn't think it needed to be really sweet. If I was serving it with a tart cherry pie, I might want a sweeter whipped cream. But that's part of the fun of making your own - you can make it the way you like it, and flavor it the way you like it. This time, I used vanilla powder instead of vanilla extract. Combine the heavy cream, powdered sugar, and vanilla powder in a medium bowl. Whisk until it's as thick as you like. For the finished sundae, I garnished with some chocolate pearls for a little crunch. Shaved chocolate or sprinkles would be great. Or, how about a fresh strawberry? This is another recipe from the Whole Grain Baking book by King Arthur Flour that I used for my Knead the Book column on Serious Eats. I loved these crackers, and thought they'd be worth sharing here, as well. I buy the commercial Wheat Thins once in a while. There's nothing wrong with them, but I think they're best as a vehicle for something like cheese. But these home made crackers are snack-worthy all by themselves. If you're making them for a party or you're serving more than a few people, I suggest making a double batch. These recipe makes a lot of crackers, but they're small and thin, so it's easy to eat a lot of them. The recipe suggested adding salt to the top of the crackers, if desired. If you're a salt fiend, that would be okay, but I thought these were great without added salt. Sesame seeds would be an interesting addition, though. Combine the flour, sugar, salt and paprika in a medium bowl. Cut the butter into small pieces and mix it in thoroughly, using your fingers, a pastry blender, a mixer or a food processor. Combine the water and vanilla, and add it to the flour mixture, mixing until smooth. Preheat the oven to 400˚F. Lightly grease baking sheets or line with parchment paper. Divide the dough into 4 pieces; keep the other pieces covered while you work with one at a time. Lightly flour your work surface and your rolling pin and roll the piece of dough into a large rectangle, which should be at least 12 inches square when trimmed. Keep your pin and the surface of your dough evenly floured. Flip the dough frequently to keep it from sticking, but too much flour will make it difficult to roll. Keep rolling until the dough is as thin as you can get it without tearing, at least 1/16 inch thick. Trim the dough to even the edges and use a pizza cutter or a sharp knife to cut the piece into squares approximately 1 1/2 inches wide. Transfer the squares to a prepared baking sheet; you can crowd them together, as they don’t expand while baking. Sprinkle the squares lightly with salt, if desired. Repeat with the remaining pieces of dough. Save the scraps under plastic wrap and reroll them all at once just one time. Bake the crackers, one sheet at a time, until crisp and browned, 5 to 7 minutes. If some of the thinner crackers brown too quickly, remove them and return the remaining crackers to the oven to finish baking. These crackers bake quickly, so watch them closely – even 30 seconds can turn them from golden brown to toast! Remove the crackers from the oven and cool on the pan or on a plate; they cool quickly. These crackers will stay crisp for several days, but are best stored in airtight containers. Milk Toffee - Have you ever had this candy?